Assuming that your email campaign has a specific goal, it’s advisable to focus on one or maybe two calls-to-action. This avoids confusing the recipient and keeps their mind focused on the job in hand. A case study from Whirlpool shows that when the brand reduced the number of CTAs in its email from four down to just one, it achieved a 42% increase in clicks. Originally the marketing team had stuffed the emails with CTAs based on the assumption that more buttons equals more clicks. However all four CTAs related to separate actions, which distracted from the main focus of the email, which was to drive users to a rebate landing page and encourage them to visit a showroom. A good CTA needs to stand out from the rest of the email and grab the user’s attention. This can be a tricky task when marketers have to take into account existing brand colour schemes and templates, but there’s more than one way to catch a person’s eye. For example, if you’re opting for a button rather than a text link, make sure there’s plenty of space around the CTA and don’t position it in the middle of a load of text. I’m undecided about this example from Reiss. It stands out against the blue background and certainly fits with the brand image, but I’d be interested to see whether a button had greater impact. I also counted more than four CTAs in this email alongside a number of other links, which could potentially dilute the impact. 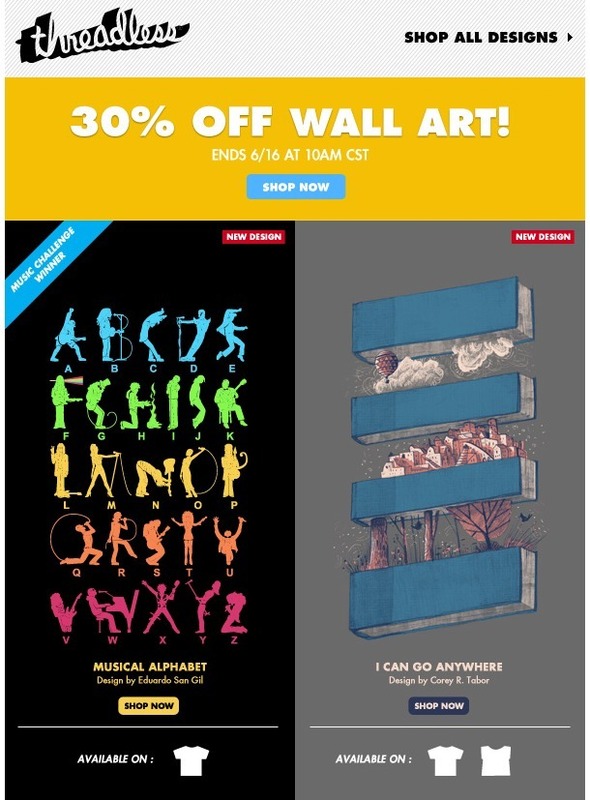 This effort from Threadless is slightly better as there’s a persuasive, time limited offer and a clear CTA. However there are still a large number of buttons and the email itself is so colourful that it’s difficult for the buttons not to clash. 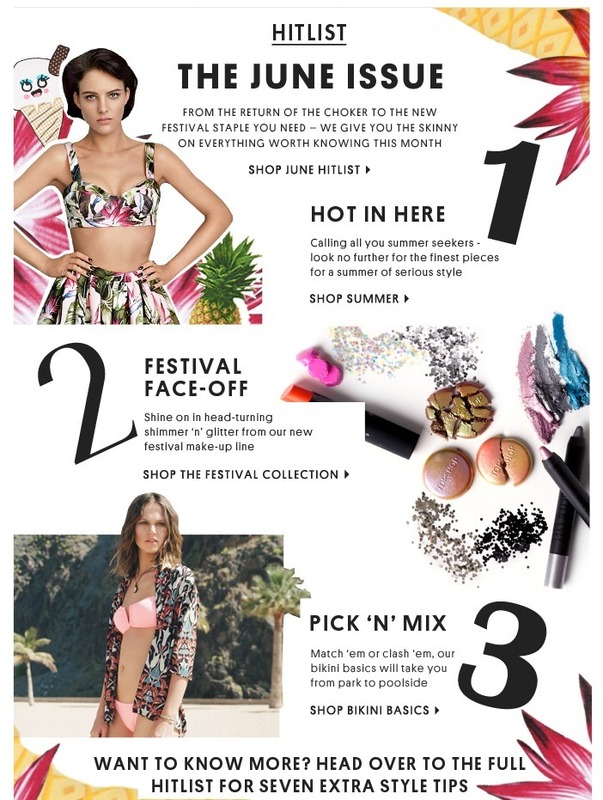 This creative from Topshop is quite poor – it’s a monthly newsletter with the subject line ‘What’s hot in June’ so one would expect it to have a lot of content, but the text and CTAs are all the same colour so nothing really jumps out. As the name suggests, the job of a CTA is to encourage the reader to perform a particular action. To help achieve this consider using punchy, direct copy to create a sense of urgency and stir your customers into action. In the example above Threadless has opted for ‘Buy now’, which is about as succinct and direct as you can get. These tips are only meant to act as guidance and inspiration for your own email marketing efforts, they are not hard and fast rules. All aspects of your email content should be tested to find out what works for your marketing efforts. And even when you’ve found a winning formula, keep on testing new ideas or the results may end up diminishing over time. How’s this for a simple, focused email message? Are you ready for the World Cup? If not, shop New Look’s men’s or women’s ranges. It does seem to be missing two apostrophes there though. Another great example of how to create a simple, effective email CTA. There’s a sale on, so click the button to shop it. The CTA itself doesn’t jump out at you in this example from Mr Porter, but I am a fan of the simple creative. This email has a further 10 ’Shop now’ buttons further down the email, which is perhaps a few too many. It could be argued that this CTA is a bit vague, as the email is advertising a sale but the copy says ‘Shop fashion’. This CTA stands out against the rest of the content and is surrounded by plenty of white space. ASOS’s emails tend to be quite succinct and I like that the contrast of this CTA against the white background. Though you can pretty much click on anything in this email to access the sale. This example from Macy’s is bonkers. The subject line advertises Father’s Day gift ideas, but then the first link is for women’s products and there’s also a link for handbags. It feels like there’s a bit too much going on and a few too many product managers demanding to get their share of the pie. And this isn’t even the entire email, there are five other promos beneath this one. 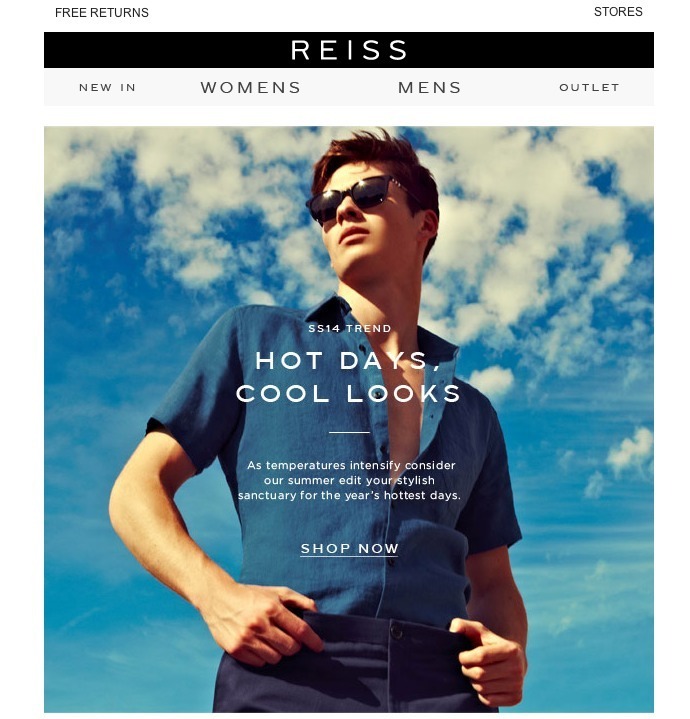 Reiss sticks faithfully to its white, text CTAs, which maintains a consistent brand image but means they can occasionally be difficult to see. In this example I think it’s easy to overlook the CTA against the light background. Sorry to keep harping on about Macy’s, but this email is extremely cluttered. I didn’t even notice the promo code the first couple of times I looked at it. It’s also followed by a huge amount of other content promoting homewares, furniture, cologne and even mattresses. Although the CTA sticks out, there’s too much text on this email and there’s not enough to inspire the recipient to actually click on anything. Currys also falls victim to the trap of cluttering its email with far too many different offers and promotions further down. Another busy, busy email from Macy’s, this time with a confusing selection of offers. The box on the left offers you an extra 20%, 15% and 10% off – which is it? Or you can get $10 off. Or there’s an online exclusive deal at the bottom for 25% off clearance products. Super Saturday sure is a confusing time down at Macy’s. Email remains one of the most effective and versatile channels available to marketers. One of its main strengths is the variety of goals that can be achieved through email, including sales, customer service or aftersales. Each different campaign may have slightly different KPIs, but there are some that are universally applicable. Here I’ll summarise some of the most important email KPIs that marketers need to be aware of – it’s for beginners, so experts should already be well versed in all of these. And for further information on how to get more from your email campaigns, download Econsultancy’s Email Marketing Census Report 2014. Email marketers and brands must be well aware of the existence of ‘report spam’ buttons on email clients, and the potential risks to sender reputation if recipients press them. Then there’s the new Gmail unsubscribe feature. Though this is likely to be less harmful than the spam button, could help Google distinguish between ‘good and ‘bad’ senders. Despite these features, and customers’ frustration with what they consider to be spam, some unsubscribe processes are just too painful. I’ve been clearing out my over-cluttered inbox, and unsubscribing from a few unwanted emails.